Microscan will present barcode verification and print quality inspection product capabilities helping manufacturers and retailers comply with GS1 Standards at the GS1 Connect Conference in Las Vegas, NV. New LVS® product advancements as well as time-proven solutions to be featured at the conference make Microscan a one-stop technology partner for the companies willing to ensure they are GS1 compliant. RENTON, WA, May 22, 2017 – Microscan, a global technology leader in barcode, machine vision, verification, and lighting solutions, announces that it will demonstrate advancements in barcode verification and print quality inspection solutions from Booth #16 at the GS1 Connect Conference, June 20 and 21, 2017 in Las Vegas, NV. With the barcode reading and verification solutions to be featured at the conference, Microscan represents a one-stop-shop for companies to ensure GS1 compliance. As a longtime member of the U.S. GS1 Solutions Partner Program, Microscan provides manufacturers and retailers with technology solutions and guidance to address barcode verification, print quality inspection and compliance with GS1 standards. Microscan’s solutions provide both in-line and off-line verification of codes (symbols and text) printed on labels and packaging. Verifiers identify errors in code readability and compliance as codes are printed, allowing manufacturers to address printing or formatting issues before incurring fines and scrapped product downstream in the supply chain. Microscan off-line verifiers enable users to test newly designed labels for quality and compliance issues before printing, while Microscan in-line verification systems are configurable into manufacturing lines and printers to check label accuracy on the fly during label printing. These verification solutions address the growing need for compliance to the FDA’s Unique Device Identification (UDI) initiative, and GS1 data structure, as well as other regulated barcoding and product serialization standards. 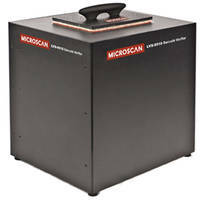 Interested visitors to Microscan’s booth will have the opportunity to test and verify their own labels with the LVS-9510 Barcode Verifier for stationary desktop verification, the LVS-9580 Handheld Barcode Verifier and a soon to be released LVS-9585 Handheld Barcode Verifier with advanced lighting options and powerful software functionality for both printed labels and direct part marking (DPM). This extension of the Microscan LVS® product line has the ability to test both DPM parts as well as printed labels to a broad variety of global application standards, and provides comprehensive quality analysis and reporting features. LVS-7510 Print Quality Inspection System, which is also going to be on display, integrates LVS® image scanner components seamlessly into the printer discharge of some of the most popular brands of thermal transfer printers. The LVS-7510 is used for 100% label inspection including 1D/2D barcode verification, OCR, serialization and blemish detection in medical device manufacturing, electronics, pharmaceutical manufacturing, consumer goods packaging and automotive components manufacturing. MicroHAWK® UHD Barcode Readers to be demonstrated at the conference will feature the internal inline verification process meeting the needs of manufacturers for internal quality trend analysis. Equipped with the newly released Ultra High Density lens, MicroHAWK® Barcode Readers are a perfect match for manufacturers using very small and difficult-to-read barcodes, including Data Matrix two-dimensional (2D) symbols and direct part marks. Visitors to Microscan’s booth will have an opportunity to test the ability of MicroHAWK® UHD Barcode Readers to read symbols with an x-dimension as small as 2 mil (0.0254 mm). Microscan’s dedicated product team will be available throughout the GS1 Connect Conference to discuss custom projects and solutions with visitors to the Microscan booth. Meetings with Microscan’s experts can be scheduled here http://info.microscan.com/GS1-Connect2017.